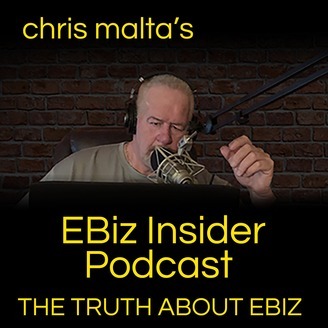 Learn the TRUTH about ECommerce from Chris Malta. 25+ years in Online Business. Business Owner, Author, Radio Show Host, Internet Convention Speaker, Mentor and ECommerce Educator. Everybody who decides to open a home-based ECommerce business is going to come across a huge variety of scams. It's unavoidable; there are literally thousands of people out there who will lie to you and try to cheat you out of tens of thousands of dollars. Learn what happens, how to avoid it, and what the true cost is. Find much more TRUTH about ECommerce on my site. Everybody who decides to open a home-based ECommerce business is going to come across a huge variety of scams. It's unavoidable; there are literally thousands of people out there who will lie to you and try to cheat you out of tens of thousands of dollars. They know they're lying. They know they're cheating. They know they could be prosecuted and sued for what they do. But the money is so good (for THEM) that they just can't resist. You're listening to this podcast, which means you either have an interest in STARTING an EBiz, or you already HAVE an EBiz. If you're just starting out and you haven't spent any money yet, you're one of the VERY LUCKY FEW who just might make this happen without getting screwed to a wall financially. If you HAVE an existing EBiz, there's a 97% chance it isn't making you any real money, and an unbelieveable 90+% chance that you've been CHEATED out of at least $15,000 dollars. Possibly as much as $35,000 to $40,000 dollars. I've been running my EBiz Insider Workshops online for nine years now. I've done nearly 800 seven hour Workshops with people just like you. More than 90% of the people who attend those Workshops have been cheated out of tens of thousands of dollars by some group of EBiz scammers. Yes, I said GROUP. EBiz scammers run in packs, like rabid wolves. They hunt TOGETHER to take you down for every last dime they can, and leave you lying in a ditch when they're done. Does that sound alarmist? Does it sound like a conspiracy theory? If you're one of the VERY FEW who hasn't been nailed by this stuff YET, it may sound like that. But to the more than 90% of those who listen to this podcast who HAVE spent money with these dirtbags, you KNOW, don't you. It couldn't BE more real. And it couldn't be more disgusting and discouraging. The minute you sign up for a Free Trial Website, an EBiz App or a Tool, join a Free Webinar, sign up for a mailing list, go to a hotel seminar, take adive from a public "Experts" Forum, etc., etc., these people HAVE YOU HOOKED. More importantly, they have your email address and possibly even your phone number, if you gave it to them. If you didn't, they'll try to look it up online through various phone book and location services. How do they HOOK you? THEY MAKE PROMISES THEY CAN'T KEEP. Please understand this: NOBODY can PROMISE you success. NOBODY can GUARANTEE that you'll make money. Not in any kind of business, not EVER. But these people will do that all day long. They'll show you websites that they claim make millions of dollars. Those sites are fakes that they own. They'll show you bank statements that have thousands of dollars in deposits coming in every day. That's nothing but Photoshop and a printer. They'll give you testimonials from people who claim to make tons of money from their "systems". Those people work for them. They're not real EBiz owners. They will absolutely GUARANTEE your success. Then they'll HELP you (yes, actually get online with you and HELP you) apply up for forty of fifty thousand dollars' worth of credit cards that you then MAX OUT with THEM, and they'll tell you it's okay because they PROMISE you'll make all that money back within a few months and pay off those cards. But it won't happen. They'll tell you it's okay to take a SEVENTY THOUSAND DOLLAR MORTGAGE out on your HOUSE and spend it with them, because you'll make the money back in a few months. But it won't happen. I'm not just speaking in general terms here. Everything I've just said has ACTUALLY HAPPENED to people I've personally worked with in my Workshops, talked to over the phone or have met in person. ALL of it, with those actual numbers. Keep these following things in mind. Write them down. Stick them up with a fridge magnet. Ready? ANYBODY who tells you that Amazon, eBay, Affiliate Marketing, Template-based Websites, SEO Apps and Tools, Private Labeling, Importing from China, using AliExpress or Oberlo, outsourcing your marketing and graphics, OR that you'll make good money QUICKLY online in ANY way is absolutely flat-out lying to you. I WILL guarantee THAT. So like I said, better than 90% of the people reading this post have already been burned this way. If it's happened to YOU, I give you a TREMENDOUS amount of credit for even being here at all. Most people just curl up into a ball and sob for six weeks once they realize what happened, and then spend the next ten years trying to dig themselves out of all that debt working three jobs and selling half their posessions. If it has NOT happened to you yet, BE VERY AWARE that when you step into home-based ECommerce, you're stepping into a live minefield IN THE DARK wearing size 58 boots and pushing a thirty-foot-wide lawn roller right in front of you. If that sounds really scary, GOOD. It's meant to. The point of this discussion, though, is to talk about those who HAVE been scammed like that, and the effect that such a horrible experience has on you. It robs you of something far worse than money. Yes, even money in those huge amounts isn't as bad as the true cost of being a victim of these disgusting, worthless people. So does it rob you of that's even WORSE? Your self-confidence. Your self-esteem. Your trust in yourself and in your own decision-making ability. That's worse, because it goes much further than just the money. It affects your ENTIRE LIFE. Your personal relationships. Your family members. Your living situation. Your ability to support yourself and your family. Your ENTIRE FUTURE is forever changed by something like that. Most people who have been hit hard by these sickening scammers end up feeling deeply personally violated, and many end up suffering from years of depression and other psychological damage. The countless number of people I've had conversations with over the years who HAVE been victimized in this way tell me that they feel foolish, even stupid for allowing this to happen to them. If you're one of those people, you CAN'T put that on YOURSELF. You were LIED to. You were CHEATED. You were VICTIMIZED, plain and simple. The people who do this to you are very, very good at what they do. They know the psychology, they know the buzzwords, they play on your emotions and your desire to better your life, and they LIE. It's not the fault of the victim. It's the fault of the victimizer. I personally am a big believer in Karma. What goes around comes around. Karma can be a screaming banshee on a rocket sled when it needs to be, and I actually ALMOST pity those victimizers when it catches up to them. And it WILL. And I said I ALMOST pity them. Okay, if you can't tell by now, I get really fired up about this whole thing. It pisses me off. It disgusts me. It makes me wish I could sit those scammers down one at a time in a room with all the people they've hurt, and make them look those people in the eyes and REALLY SEE the monetary and phsychological ruin they create every single day. There are two reasons I feel that way. One is that I'm human just like everybody else. I've actually listened to those victims tell those stories, literally thousands of them, over the nearly 20 years that I've been trying to help people understand this business in different ways. It's taken it's toll on me, too. I've listened to people on the other end of the phone who are literally sobbing about all the money they've lost, about how horrible they feel, about how they don't know what they're going to do when their spouse or family finds out. That's no exaggeration, it's absolutely true. And it's heart-breaking to hear over and over and over again from so many people for so many years. The other reason is because this is MY CHOSEN INDUSTRY. I was here 25 years ago at the very beginning. I actually HAVE made millions in this business, because I don't just TALK about it, I DO all the things I talk about. And seeing these inexperienced talking-head slimebuckets who call themselves "ECommerce Marketers" but have never actually WORKED in this industry *EVER*, do so many bad things to so many good people is incredibly frustrating. It also ends up making me look guilty by association. It's harder for me to actually tell people the truth and help them because they've already been burned so badly and simply have no trust left to give. I've been called names and accused of lies I've never told just because I'm IN the industry, by people who don't know me at all and have never read or listed to anything I do! And you know what? I don't blame them. I don't get angry with those people. I understand how they feel, because I've talked to so many of them. Anyway, I'll end this rant with a really serious warning. BE VERY CAREFUL out there. I've told you what to look out for. It's no joke. If you've been victimized, it was NOT your fault. If you haven't, they're coming for you. Don't let them get you. 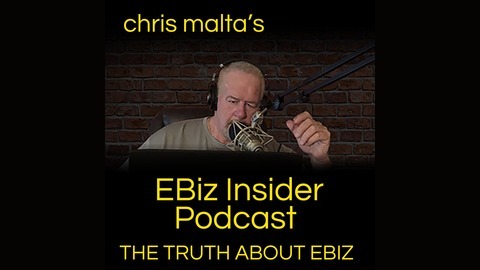 If you'd like to hear the TRUTH about this business for once, check out my FREE EBiz Insider Video Series at ChrisMalta.com. Thanks for listening, and I'll catch you later!